I don’t really want to share any of this. I feel uncomfortable, weak, vulnerable, and afraid. My mind is like a pendulum swinging from, “I don’t have any problems and it’s a sham to pretend that I’ve struggled with mental health issues,” to, “I’m too crazy and now people are going to know and they won’t like or respect me anymore.” So uncomfortable, so rooted in stigma and fear. In the most wonderful TED talk, Brené Brown discusses the concept of vulnerability and how the act of being vulnerable is the cornerstone of human connection and the source of true peace and belonging in this human existence. She explains that in order to experience anything good, we must allow ourselves to experience the challenges too — that we can not selectively anesthetize ourselves to what we classify as the negative — sadness, shame, discomfort — without blocking what we deem to be positive as well, which includes joy, pleasure, and genuine connection with other people. Why couldn’t you sleep? Why couldn’t you eat? Why did you cry every day for months? Why were you so isolated? Why have you chosen alternative healing modalities over mainstream western mental health options? All good questions. All clear answers. All incredibly uncomfortable to share about so openly. 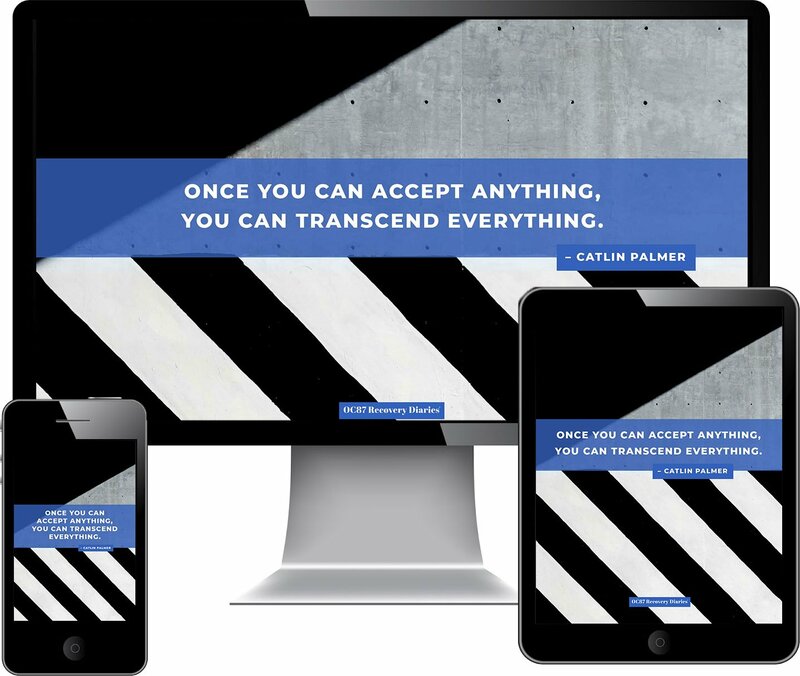 Normally I work behind the scenes on this website, writing the code for posts, interviewing people who want to share their own recovery journeys, and collaborating on the production of video entries. 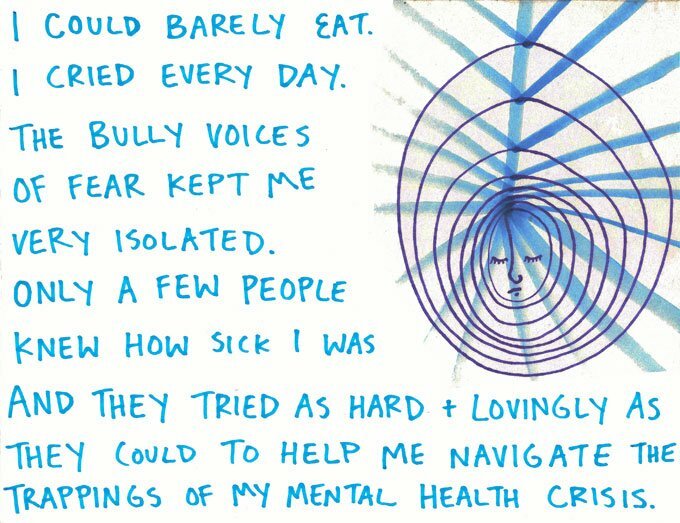 I tell people all the time that they are being brave for sharing their stories to combat mental health stigma. I tell people that it’s safe to be vulnerable in this way on our website. I admire those people. Now that I’m choosing to reveal parts of my own story, those statements are sounding a bit thin. So I need to remember why I’m doing this, why sharing diverse stories of mental health challenges is important. 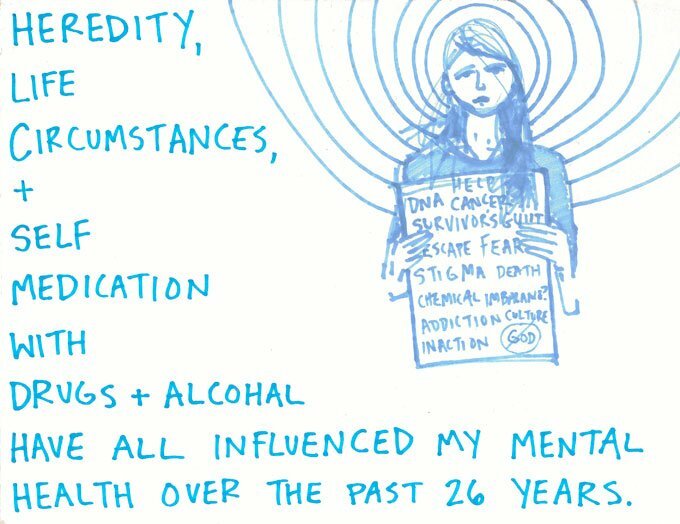 All of the reasons I am afraid to share these parts of my story are linked to stigma — the fear that people will judge me negatively for being open about depression and anxiety — which is something I care deeply about shifting, and it’s what this website, OC87 Recovery Diaries, is all about. I’ve made art my whole life. I grew up in a family of writers, musicians, artists, and teachers. Creative expression has been encouraged for me at every stage of development. 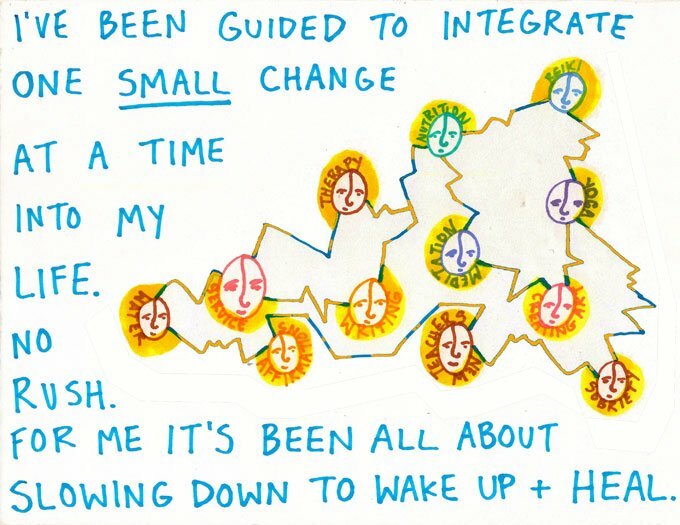 I grew up understanding life as a kind of performance, the environments I inhabit as installations, and knowing that there are many non-verbal ways to communicate about my experiences navigating the world. Drawing and writing intermingle with filmmaking, dancing, singing, cooking, and other overlapping creative communication outlets in my life. The anticipation of creating the drawings and writing for this post was very uncomfortable and that experience is indicative of many of my mental health challenges. I can get so very caught up in future-tripping and in-action so that whatever thing I’m avoiding just grows and grows into soul-sucking anxiety. My teacher Sophia Hoffer-Perkins explains that anxiety is not a feeling, it’s what happens when we avoid experiencing an actual feeling. 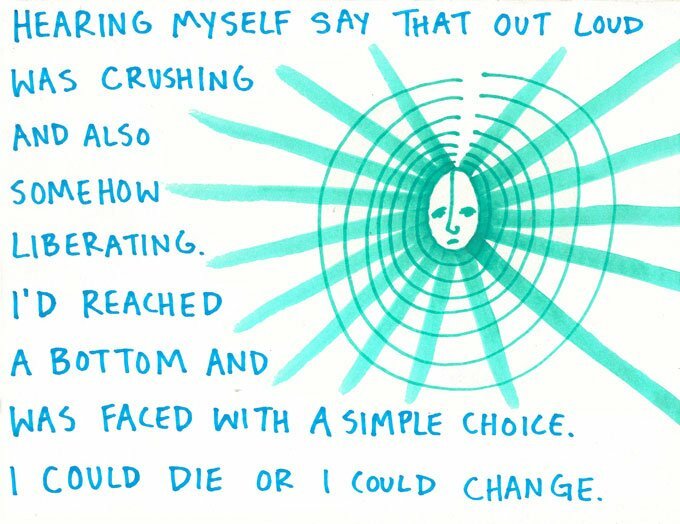 For me the true feelings that I’m usually avoiding while experiencing anxiety are sadness, anger, fear, and grief. 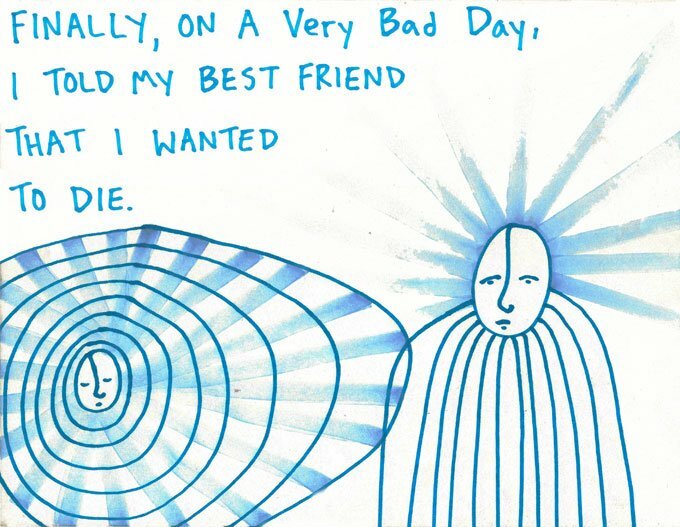 I’ve had to learn to ask for help from friends, family, and my inner guide / higher power to do most things that work in my life, and creating these drawings and writing these words was no different. As soon as I got out of my own way, it all flowed so easily. It was interesting for me to see the drawings that emerged. For many years I drew faces with spirals surrounding them. 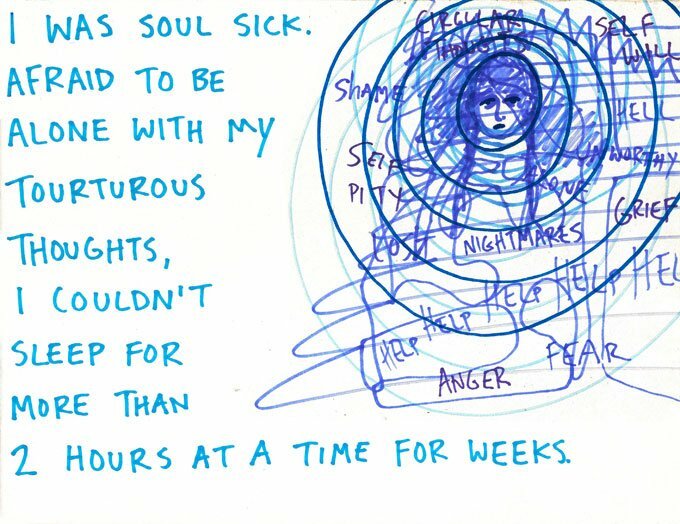 In the summer of 2008 I met with an art therapist who suggested that my sad faces might indicate depression and that the surrounding concentric circles could suggest that I use layers of intellect, charm, and creativity to keep people out of truly knowing me or the fact that I am suffering at all. 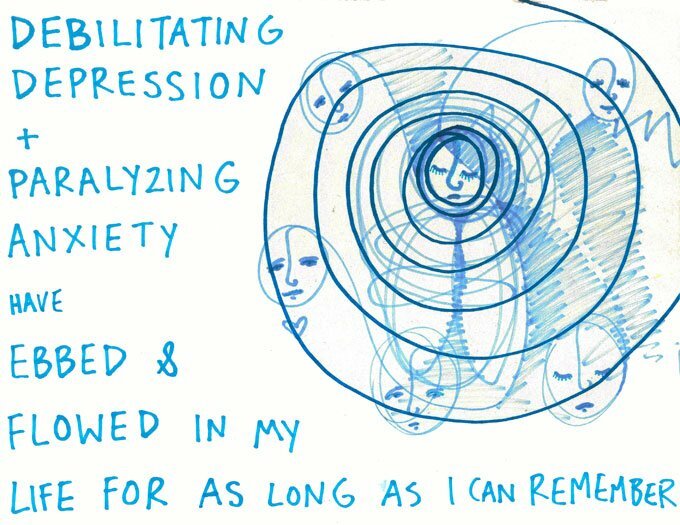 The art therapist was on to me and I stopped drawing the circles around my faces as much as I could, though they would emerge against my will in drawings over the years on particularly depressing afternoons and in the middle of the night. I’m not surprised that the circles reemerged in the drawings for this post. Seeing the spirals around my faces feels like visiting with an old dear friend in dire need of some tender love and care. I do want to tell you more about the challenges I’ve encountered throughout life that have connected to my experiences with mental health including coming out as queer at the age of fifteen, living through cancer at the age of twenty, all kinds of survivor’s guilt, thoughts about nurture vs. nature, and navigating addiction culture. 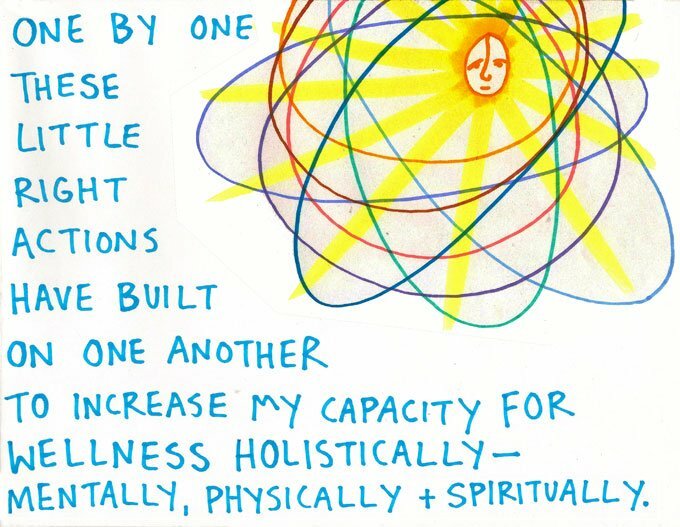 I also want to show you more about the practices that have — one by one — truly transformed my life to a place of holistic wellness in body, mind, and spirit. Those practice include Reiki, yoga, mediation, nutrition, therapy, creativity, and consciously working to be of service. For now though this is what I can be brave enough to share. 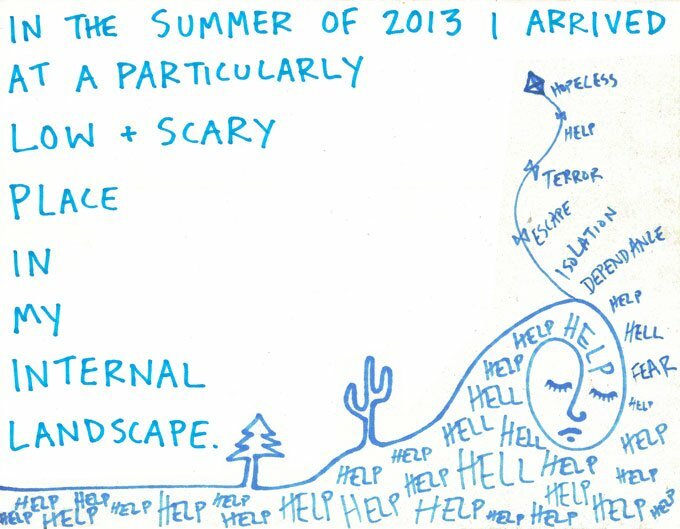 My mental health internal landscape got really ugly in the summer of 2013 and I was pushed to an edge I hadn’t experienced before. For now I can share this part of my story and I look forward to sharing more as time unfolds. Please visit my website and be sure to sign up for my mailing list to get updates.